Picnics are both lovely and adventurous. The comfort of having to fold up without much laboring to pack your temporary home make the tent perfect. Coleman Instant Canopy Tent does just that! And just so you know, the fun does not stop with the setting of the sun as it has built-in lights. Try a night in, and you will not tell the difference between being in your home. 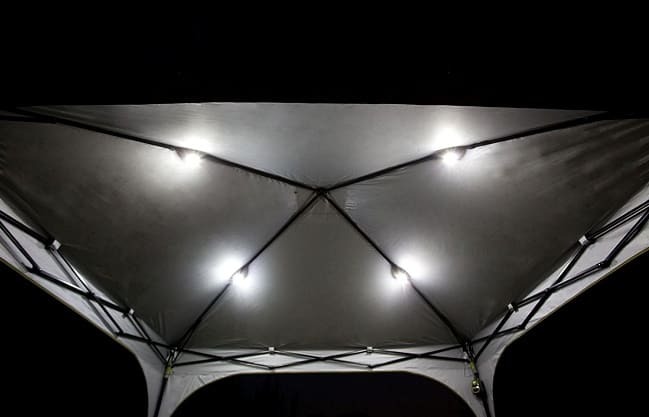 Measuring 54.2 x 11.2 x 9 inches and weighing 46.3 pounds, the Coleman Instant Canopy Tent with LED Lighting System is sturdily constructed, with a 28mm steel frame and a tough cover. The tent lets you enjoy the outdoors any time of the day or night. You want a tent that offers great possibilities for picnics, barbeques, campouts, and more. A tent that does not offer only the basics but affords you convenience, class, and prestige. The tent has increased weather resistance thanks to its inverted seams which prevent needle hole from being exposed. Additionally, the door has extra reinforcement made from weather resistant fabric. Upon assembly, the canopy's welded steel plate provides a stable shelter on all surfaces be it, concrete, asphalt or grass. With all these quality features, you can only settle for the best canopy by settling on Coleman Instant Canopy. Your family is significant to you, and you would want them secured from those harmful UV rays from the sun. You will make a whole lot of difference and at the same time combine comfort with value for your money buying the tent made with UVGuard material offering 50+ UPF protection. You want to have fun even after the sun goes down which makes lighting a priority. Built-in lighting brings convenience by not having to place lighting beams in not strategic positions and even the risk of them falling on people. 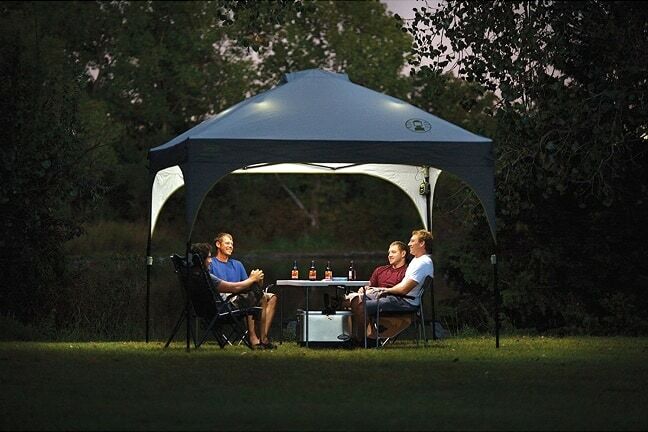 Coleman Instant Canopy comes with six built-in CPX LED lights providing 400 lumens of illumination. Power options for the lighting system are four D batteries or a rechargeable CPX 6 cartridge. With beams of light emanating out from above you, dine with full overhead illumination at dusk and dance at night without having to bring out some lanterns. Adjust the light from the system to your desired ambiance using the dimmer switch. With all these features, the canopy offers more than comfort, reliability, prestige, and value for your every spent coin. You should consider buying it to reap all these benefits. 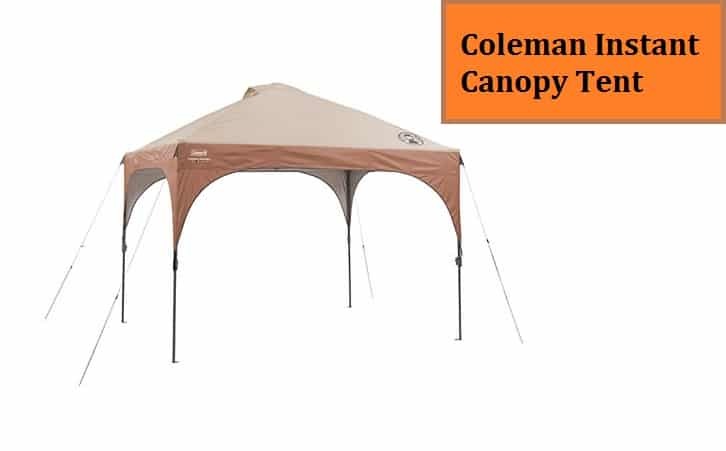 Coleman Instant Canopy Tent with LED Lighting System passes the benefit of convenience to you even after you are done with setting up and bring it down and is now time to transport it to the car back home. You are tired by now, and the last thing you want is lifting a weight. The tent offers comfort in transportation which is why you should consider acquiring it. You would want a tent that is considerate of you being alone when setting it up at some point by simplifying the setup process. 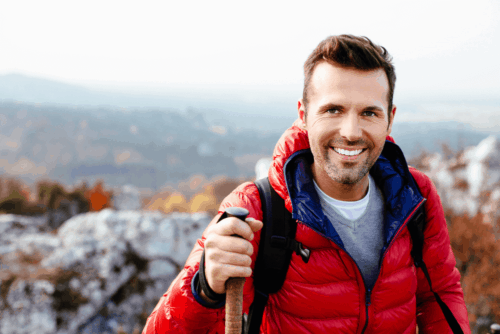 The conventional and instant setup pitches offer more than the convenience but also bring in simplicity which makes a lot of sense during outdoor activities. Set up the tent in about twenty minutes in conventional pitch and under a minute in instant set up. If you are thinking about buying a tent that offers convenience, you should find this one the best. Safety features in a product is a crucial consideration in making a purchase decision. You want a product that has the highest safety assurance for your family which is what this canopy offers. 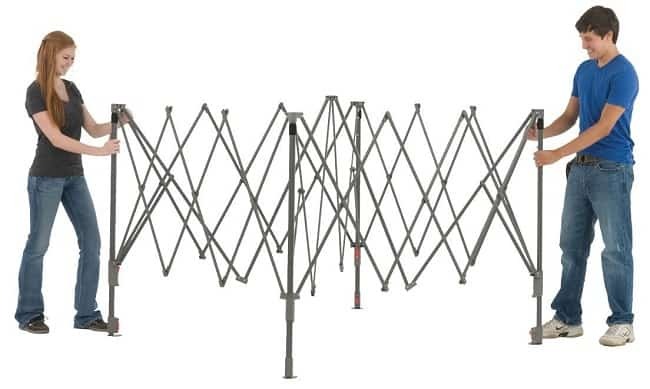 Extend the tent's telescopic poles safely and comfortably since it has been made with Comfort Grip technology for pinch-free adjustment during setup and takedown. All you need when setting up or taking the tent down is a single squeeze of the lock. Nothing defines outdoor convenience better than Coleman Instant Canopy Tent. It is effortless to set, and self-contained lighting can be adjusted to suit the mood. The tent is the only one of a kind that accommodates users with different time to spare setting it up. You will require such an understanding when all you want is somewhere to spread, relax and sleep.